So excited to catch her first fish! After learning to fish for over a year, big sister FINALLY caught her first fish! As you can see from the picture, she was thrilled! Daddy O and I were so happy and proud of her. 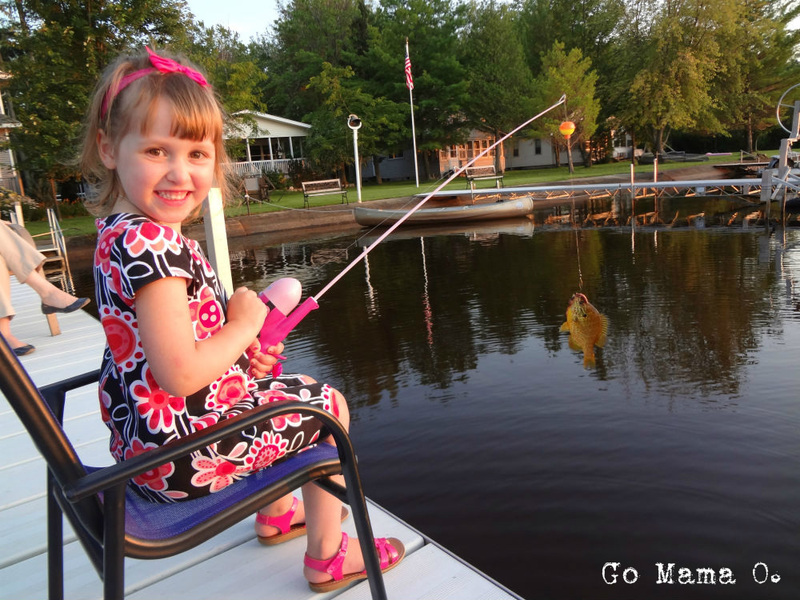 This WAS a big summer for her, as she grew more independent and confident in so many areas – bike riding, swimming, helping out at home, and of course fishing! This was also the last summer before officially starting school with our district as part of the 4 year old Kindergarden program. And much like the fish the she and her cousin caught that night, I have to let her go. A few more pictures give you a taste for that evening’s lovely setting. Looking out past the dock, we watched a beautiful sunset as the kids excitedly caught fish after fish. It was a million dollar moment for sure! Slowly the sun sank behind the trees as the sky continued to glow warm hues. Its setting reminded me of how quickly the month of August went by, leaving summer to slip through our fingers. Going. Going. Gone! Goodbye summer. It’s been fun! In a few days I’ll watch my big girl get on that school bus, excitedly look out the window & wave as she goes to school all by herself. On the “practice run” of riding the bus, she already explained, “Mom, I’ve done this before. I know how to ride the bus.” I’ve decided that after waving goodbye, I’ll quickly load my son in my car and drive behind her bus spying (just to be sure she makes the transfer to the other bus that goes to her 4K school). Much like the pictures above, it’s sort of like the sun setting on her preschool years as my firstborn is growing, growing, and gone to school. She’s so excited to start school (see the big cheesy grin she has in her top picture), and I know I have to let her grow and learn from new teachers and classmates. The act of letting go / watching your kids start school is certainly one major parenting milestone! Wish me luck this week, and pass me some Kleenex! What is your best or favorite picture from summer? Is anyone else feeling emotional about summer ending and school starting?